The staff and Midshipmen have had her out for a shake-down and it was smiles all around. Everyone's looking forward to great things next year! Special thanks to Midshipman Billy Rudiger, who knew that the most important thing to pack for a classic schooner regatta was a drone. The Robert Crown Sailing Center played host to approximately 60 former sailing team graduates and staff members. The 1929 John G Alden schooner Summerwind escorts the replica 1851 schooner America into Annapolis harbor. Jimmy Buffet takes the helm with America's Cup Hall of Fame inductee Jon Wright and space shuttle astronaut Capt Ken Rightler in the afterguard. A big fan of Naval Academy Sailing, Jimmy has been wearing our gear on stage this summer. After its historic win of the Hundred Guinea Cup (soon after renamed the "America's Cup") the America served both sides of the Civil War and later as a Midshipman training vessel in both Newport R.I. and Annapolis. 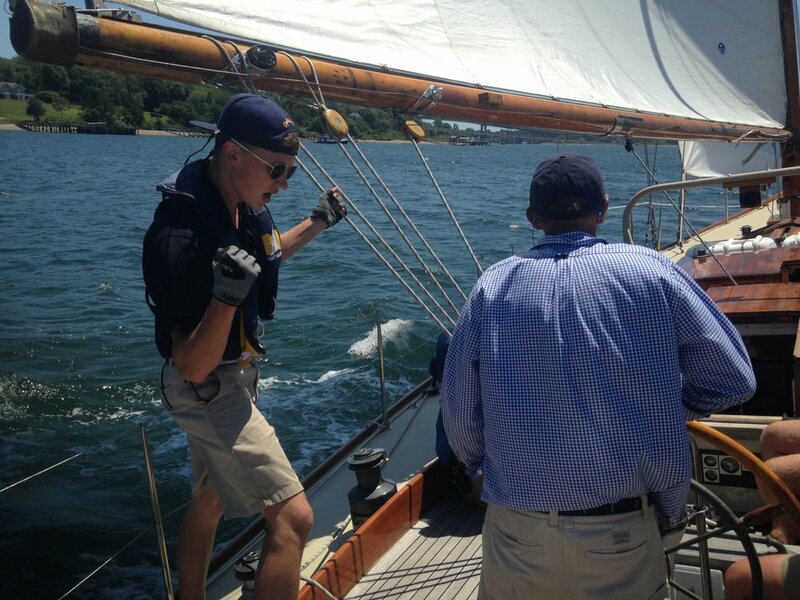 Members of the Sailing Team onboard America in the Naval Academy's Santee Basin. Summerwind Returns to Bristol, R.I.
Summerwind, our 1929 John G. Alden Schooner, was put to work this summer with a trip to Bristol, R.I. In company with 4 Navy 44s and their Midshipmen crews Summerwind and her 16 Midshipmen trained in the Cheseapeake for a couple weeks before beginning the trip down the Bay and up the East Coast. The five boats were hosted by the Herreshoff Marine Museum and the Bristol Yacht Club. 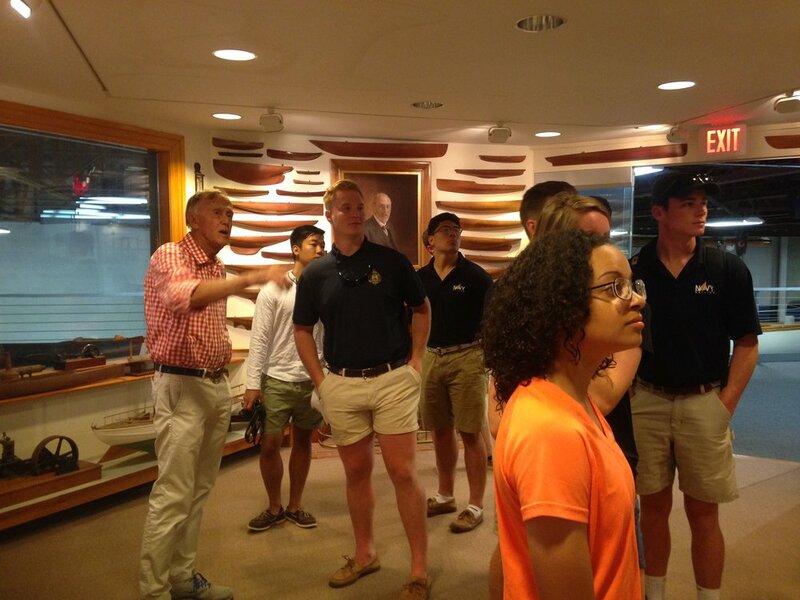 Halsey Herreshoff took a personal interest in showing the Midshipmen the best Bristol had to offer with a fascinating tour of the family museum as well as a sail onboard a couple of his classic boats (the NY40 was a special experience). The crew of Summerwind returned the favor, giving Halsey a lift down to Newport, under sail in 15 knots of perfect Narragansett bay breese. Navy 1 - 2 in the 2016 Annapolis to Bermuda Ocean Race! After a very quick shakedown Midshipman Skipper Matt Robbins and his crew aboard the newly donated KER 50 "Wahoo" took on some of the best crews on the East Coast at the 162nd New York Yacht Club Annual Regatta. Finishing 1st in 2 of the 4 races the Midshipmen came away with a class victory! The Capital Gazette published a great piece on the race here. Great shot of the Varsity Offshore Sailing Team. As the spring semester winds down thoughts turn to the sea...a lot of great racing planned for the summer. And for the Firsties...an even bigger adventure awaits! Study hard, sail fast...Go Navy! The coaching staff and Midshipmen are very excited to get her in the water for the 2016 season. Congrats to Naval Academy Sailing supporter Manouch Moshayedi and the crew of RIO for setting the Monohull record in the 1000nm Vallarta Race! Congratulations to Naval Academy Sailing supporter Alex Roepers for his victory in the 2016 Rolex Farr 40 World Championship!